Brattle Book Shop in Boston is my favorite kind of bookshop. It isn't a chain. You won't find all the latest releases. There isn't a coffee shop or a play area for your children. It isn't full of comfy chairs and carefully curated displays. What it is is a real honest-to-goodness secondhand bookshop and there aren't too many of those around these days. Nothing says happiness like rummaging through an eclectic selection of old books and discovering a treasure you didn't even know you were looking for. I only had half an hour before I had to be at an appointment but it was a half hour I put to good use. I skipped lunch in order to visit Brattle Book Shop and I think that is a sacrifice any true book lover will completely understand. The bookshop has been around since 1825 and has been in the hands of the Gloss family since 1949. It is now one of the largest antiquarian bookshops in the country. And it is absolutely wonderful. The first thing you notice when you walk down the street (well, after the sign shaped like a giant yellow pencil) is the outdoor sale room in the lot next door. I could have spent hours just here. I started grabbing books off the carts but then realized I had to be a bit more discriminating since I was going to have to carry the books around with me for the rest of the day. So many good books. I will definitely be back, probably with a few friends to help me carry my purchases. One young guy had discovered a volume of Ogden Nash poetry and was gleefully reading it to his girlfriend. I grew up on Ogden Nash and it was fun to hear the enthusiasm with which he read the poems. I hope he bought the book. Inside there are shelves and shelves of glorious books and the whole place has that wonderful old book smell. The store doesn't look like it has been updated in recent memory and that is fine with me. I bought three books and could have bought so many more. 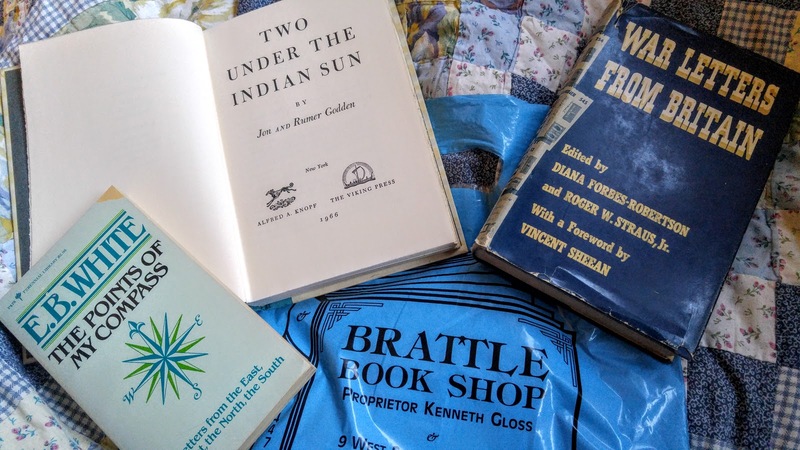 First of all, I got Two Under the Indian Sun by Jon and Rumer Godden. It is a memoir of a few of their childhood years in India. I don't know much about it, I bought it because I have always loved Godden's book, An Episode of Sparrows. Second, I bought The Points of the Compass by E. B. White. Of course I know him from Charlotte's Web but I came across some quotes on Goodreads lately that I loved so I want to read some of his essays. Finally, I bought War Letters From Britain, edited by Diana Forbes-Robertson and Roger W. Straus, Jr. I have frequently mentioned my fascination with life in Britain during the war and this looks like a fantastic addition to my growing library on the subject. In my childhood, used bookstores were very common. I have fond memories of rooting through piles of old books in many different towns and states. These days the slightly grubby, treasure filled bookstores I remember are few and far between. Last week I wanted to move into a library, this week I want to move into a bookshop. It is a joy and a pleasure to find such a perfect bookshop. You can keep your children's play areas and your carefully curated displays. 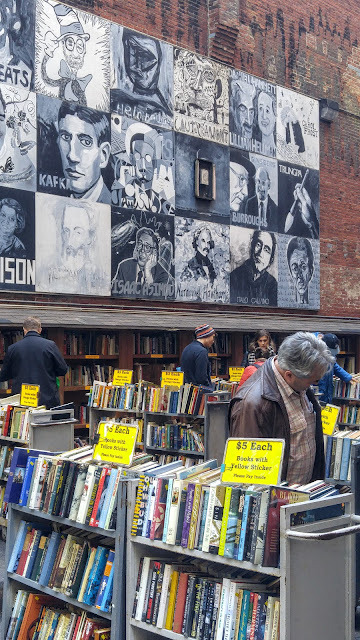 I'll take Brattle Book Shop's utilitarian shelves jam-packed with forgotten treasures and wonderful discoveries. I have to go there! It's closed on Sundays which is when I usually go to Boston, that's the only reason why I haven't been already. I want to go back when I have more time to browse. Half an hour was definitely not enough. I am going to research what other bookshops there are to visit in Boston. I am in the city fairly regularly so I might as well take advantage of it. Hi Jennifer. Thanks for stopping by my blog. I have been reading some of your posts. Your blog is impressive. I also love bookstores. In particular used ones. I have been to Brattle Book Shop and I love it. You included some great pictures. Sadly, down on Long Island. We have only one last great - used bookstore remaining. Thanks for visiting and thank you for your kind words. Used bookstores are the best kind. It is a pity there are not as many of them as there used to be. There are not really any close to me which is probably why I got so excited by Brattle Book Shop. 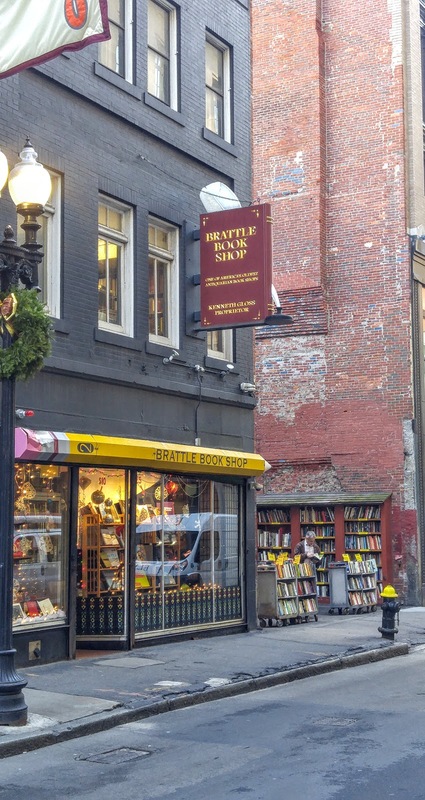 I am already looking at some other bookshops in Boston that I would like to visit. I just happened on your blog via Pining for the West's blog. I lived in and around Boston for about 35 years before moving to Philadelphia about 10 years ago. I haunted Brattle Books in the 1970s and 1980s when I worked in Boston and lived either in Kenmore Square or Beacon Hill. They're responsible for most of the books in my permanent library, all the old sets and books in lovely bindings. 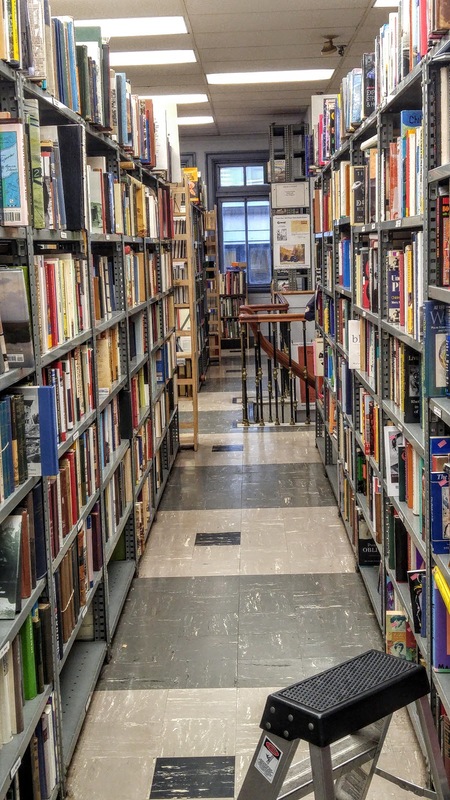 There used to be so many great used bookstores in Boston and Cambridge. The last few times I've been in Boston, I've gone to Brattle and to Commonwealth Books, only a few blocks from Brattle. I just love those wonderful old used book stores. I think it is sad that so many bookstores have disappeared over the years. At least there are still some in Boston. I haven't been to Commonwealth Books yet. I'll have to add it to my list. Thanks for stopping by and commenting.